Just in time for Earth Day! I am so excited that I have the opportunity to read this book and share my findings with you. 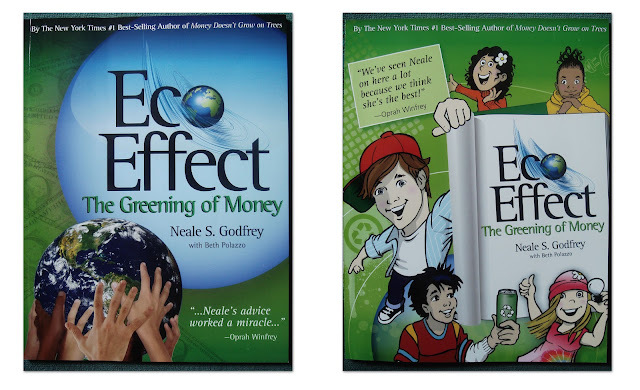 ECO-Effect: The Greening of Money was written my Neale S. Godfrey, an author of 17 children and adult books about money, life skills and values. If you know NOTHING about being "Green," then this is the place to start! Even if you are very familiar with it, like I am, you will still learn a lot. Half of the book is for adults and when you flip it over the other half is for kids. I had fun reading the kid side to my oldest, who is only 3. It helps to create a discussion about taking care of the Earth. We talked about littering, saving energy and composting. He is so excited to start composting this summer! Of course, there is only so much he can understand right not but this book will be one that I will continue to read with him as he grows. On the adult side I learned how ECOlogy and ECOnomics are intertwined. I learned about the importance of sharing ideas and questions which is referred to as ECHOing. There are great cleaner recipes and energy saving tips. "If your not part of the solution, you are part of the problem"
I love that is it geared towards both adults and children. All you have to do is flip it over. There are great little facts and fun quizzes. The cartoon illustrations keep it interesting. This book is very easy to understand and not boring. This is a great book for families. I think every household should have one. I learned quite a bit, even with all the knowledge I have about being green. Plant a Tree for Earth Day and record it in the e-forest! "ECHO to your kids and start spreading the word"